Craig’s note: While this report was written some time ago, I thought it would be fun to post this at the start of the 2010 Western States 100 entry period. Go to ultrasignup between Oct 1 and Oct 15 to put your name in the GU2O bucket for the drawing on Dec 5. Enjoy lc’s 2009 WS race report. 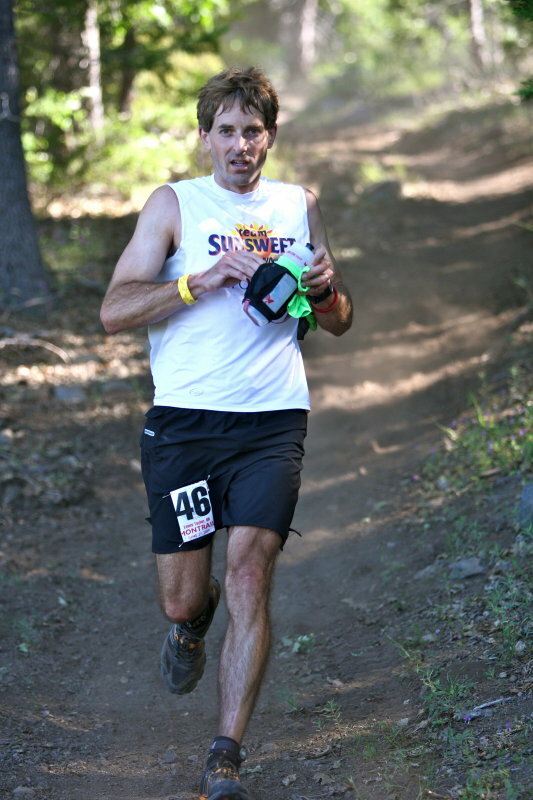 Nervous was the only way you could describe me in 2007 before I took my first run at the Western States 100. This time around, I wasn’t nervous — at least not at first. If my goal in 2007 had been to accomplish something special, I was aiming for normalcy this time around. During the crucial two weeks leading into the race, I tried to stay calm, sleep as much as possible and not do anything stupid. Don’t do anything extreme, I told myself, don’t decide you need to satisfy some weird craving, don’t decide to go for a run at midnight the night before the race. For the most part, my plan seemed to be working. I was calm and even slept some the night before, which never happens. The only problem was that not being nervous was starting to make me nervous. Shouldn’t I be more keyed up for this race? Race morning came soon enough. Before I knew it, I was kissing my wife goodbye and slapping hands with everybody I knew at the starting line. “Whatever you do, don’t go backwards” Thornley said helpfully, referring to my disastrous run at Leadville the year before, which ended with me walking backwards on the course so I could DNF 40 miles from the finish. 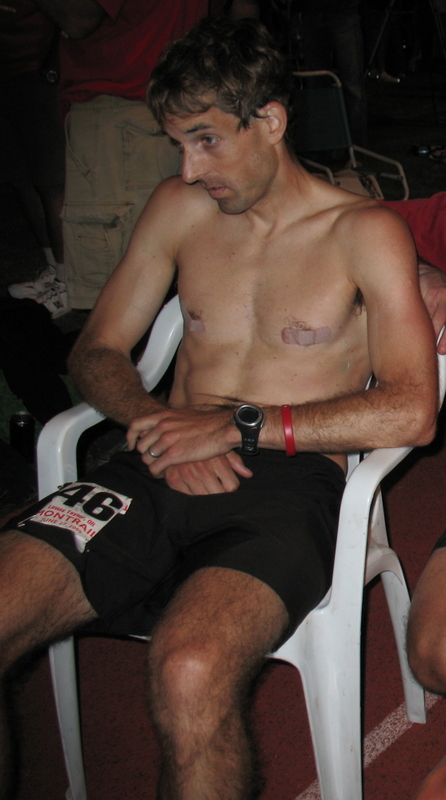 Despite getting lost at WS in ’07, the factor I was most worried about in ‘09 was my stomach, which had caved in on me during a training run just two weeks before. My plan was to eat small bites of solid foods — turkey/avocado sliders, pork and beans & pbj — for as long as possible, then switch to gels, and then go to Coke and chicken broth if things got really rough. Those early miles went down easy. I ran a bit with Tapeworm, got passed by Bev and wondered why LB, Bili, GM, WT and Monkeyboy were all behind me? Was I running too fast? Would I pay for this later? I didn’t think so. My stomach was solid, I wasn’t feeling the altitude the way I had in ‘07 and I felt well-rested. I was determined to run my own even-keeled race. Hopefully, it would lead me to a 20-hour finish. “Your destiny is in your own hands,” Erik Skaden said, running past me somewhere near the Escarpment.. I ran conservatively during the early miles, but my splits were still 15-20 minutes ahead of schedule. I wasn’t eating a lot, but that was part of the plan. Don’t overwhelm the stomach. Eat and drink slowly and survive the first 62 miles. At Duncan Canyon, I choked down some PBJ, courtesy of my father-in-law, Brent, and for the first time I felt the heat. We were lucky to have gotten several hours of cool running in the morning, but now the furnace was on. By the time I reached Robinson Flat, I had been passed by at least a dozen runners including Thornley, Victor Ballesteros, Krissy Moehl, and Monkeyboy, which actually made me feel better, since my goal had been to run slower than I was. If I had learned anything during my first two attempts at 100 miles it was that “running by feel” was a bad idea early on in a 100 miler. I passed in and out of Robinson Flat fairly quickly. On the way out, I saw Ticer and took the opportunity to remind myself to be tough. From that point on, I took every opportunity there was to douse. I was filling the bandana with ice at every aid station that had it. I saw Brent again at Dusty Corners, where I made my longest stop yet. I left the aid station drenched, along with Alan Abbs. Together we took the turnoff to Pucker Point, but weren’t able to run together for long. I traded places with Alan and Graham Cooper a few times in this section, struggling to keep moving through the heat. At Last Chance, I repeated my dousing routine, and on the way to Deadwood Canyon, I got passed by a few runners. On the steep descent to the Swinging Bridge, I made decent time and regained a couple of spots. The hike up started too soon and I could feel myself fighting to maintain a decent walk. “This is not a training run,” I reminded myself, frustrated by my inability to run. “This is race day!” I managed to jog a few steps here and there, but I was not setting any speed records going up the Thumb. I reached Bili about a quarter of the way up. He was listening to country western tunes on a portable iPod speaker clipped to his shorts, which amused me greatly. We exchanged encouraging words and kept scratching our way up. The aid station at the top was the usual scene of carnage. I tried not to look at the runners sitting in chairs. I doused with a bucket that contained a frozen block of ice (so nice!) and grabbed a lime Popsicle. I ate three bites way too quickly and two minutes later found myself throwing up on the side of the trail. Staggering in the heat, I wondered whether this was going to be the start of my usual sour stomach routine. I ate two squirts of gel, put myself back together and started running. By the time I got to the bottom of Eldorado, it was insanely hot, but I was thrilled that my stomach appeared to be holding. I packed as much ice as possible into my bandana and hat and headed out. Compared to the Thumb, the climb to Michigan Bluff was less of a grind (I think it was the ice). Still, I came into the aid station just as cooked as everyone else. My crew pulled me aside, gave me a couple sips of Coke, some broth, an ice massage and plenty of dousing, which brought me back to life. I headed down the road toward Volcano Canyon, getting some good encouragement from my pacer Christian Beck and Running Times writer Adam Chase. I passed the point where I got lost in 2007 and felt a sense of relief. I let out a yell to get myself psyched for the descent into Volcano Canyon. 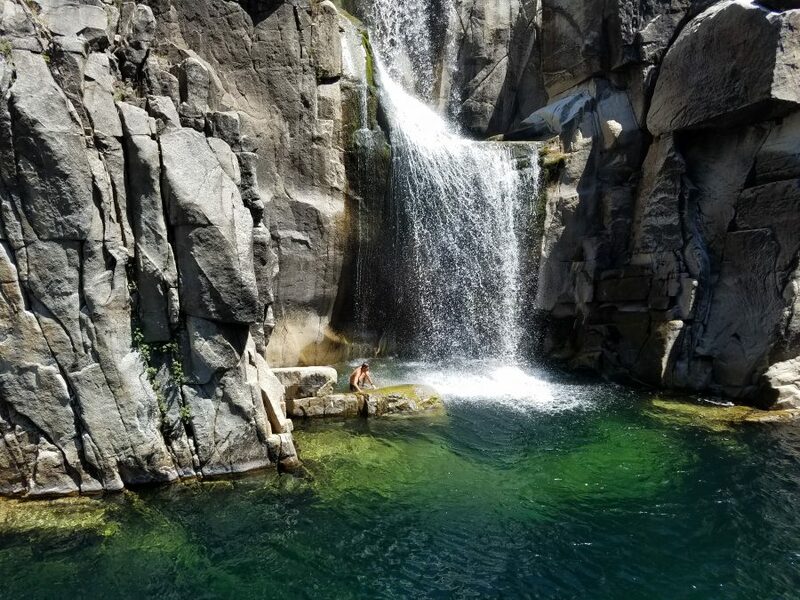 At the bottom of the canyon I submerged my whole body in the creek, then slogged my way up to Bath Road where I found my sister waiting for me with a can of soda and two bottles of ice water. We walked the uphill and she continued to build up my self-esteem, telling me how much better I looked than in ’07. At Foresthill, I felt happy to be around so many friends and family members I almost didn’t want to leave. I got a serious dousing from the aid station, then got another one from my crew. I kissed Alice and Rebecca, grabbed some new gear and headed down toward Cal Street with my brother-in-law/pacer Duff . I was feeling pretty well revived at this point. It was great talking to Duff, which helped take my mind off the miles ahead. I had been telling myself that the river crossing was essentially the half-way point in terms of effort. I’m not sure if this helped or hurt me mentally. It sure made the Cal Street section feel longer. As we reached the 6-minute hill, my pacer wordlessly took the lead. At first I wondered what he was doing since we had agreed that I would be leading, but it proved to be a good move as we reached the end of the terrible uphill a few minutes sooner than we would have with me in command. I was passed by Karl Hoagland somewhere between Cal 3 and the river. He had been haunting me since Cal 1 and once he passed me I would never see him again. At the river crossing it was a very different story than 2007 when I had stupidly stopped for a massage and earned myself the honor of the 278th fastest split between RC Near and RC Far aid stations. We picked up Leah and Christian on the other side of the river and began the slow hike to Green Gate. Christian suggested we try to catch Thornley, who was some 10 minutes ahead of me. Knowing how strong Thornley could be in those closing miles, I dismissed the idea. But Christian had planted the seed in my head. Several minutes later, Christian asked me whether I wanted to continue our slow trudge up the hill or whether I wanted to try doing some running. “Let’s keep walking,” I said, every bit the true champion. “Do you think Thornley would be walking this section?” Christian asked innocently. I started running — how could you not after a question like that? — and started laying the groundwork for a recovery. After switching from trail runners into road shoes, I left Green Gate, dreading the section ahead. My split to ALT was slower than I had projected, but I was slowly starting to come alive. 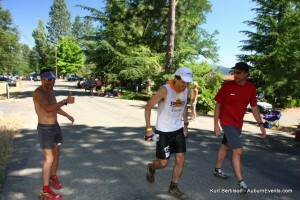 I had a scare when my weight came up 7 pounds light at the aid station, but I suspected an inaccurate scale. The more I ran, the easier it became for me to eat and drink. Christian encouraged me to take more gel since I was now eating a third of a gel every 20 minutes. Switching to full gels made a big difference. I could feel the energy returning to my body. I wanted to run. A not-so-amused (and completely sober) man gestured toward a 12-year-old boy and told me the young man would take care of me. I felt awful, but the damage had been done. Christian found out that Thornley was just a few minutes ahead and we barreled out of the aid station down the steep downhill leading to the river bed. Somewhere near the bottom, we ran into Thornley and his brother, Chris. “Hey old man, want to race to Auburn?” I asked him, not knowing how he would respond. LB laughed, wished me well and told me to go after a sub-20 hour finish. Christian had already proposed that idea, but I was highly skeptical. By my calculations, we were about 10-15 minutes off. On the way to Highway 49 we passed Tapeworm who was stumbling around and having a bad time. I remember saying something encouraging, but we could tell whatever trouble he was in wasn’t going to be easy to fix. I knew the split from the bottom of the river bed to Hwy 49 and I could tell we were making good – not great – time. At the aid station I had regained the eight pounds I had supposedly lost (damn scales!). I was starting to get excited about trying to break 20 hours and I was able to run some of the Way Too Cool climb up to the meadow. On our way to No Hands, I had to jump over a rat and we were getting so close I was starting to get paranoid about going off course. It took forever to arrive at the steep decline into No Hands and I was beginning to give up on the whole sub 20-hour thing. I made the last second decision to skip the aid station. I had to at least try. Coming across the bridge, I asked Christian to lead. He did a great job pulling and for a while I thought we’d make it. But the longer we went on, the more my hope faded. We just didn’t seem to be getting up the hill fast enough. My slow jog slowed to a walk and I told Christian it was “an impossible split.” Just then, a teenager came out of the darkness to take my bottles. My estimated split from Robie Point to the finish was 15 minutes, but my watch told me I had 14 minutes to make it under 20 hours. Skipping the aid station, we met my sister on the street and started to climb through the city streets of Auburn. I remember feeling like there was no way I could physically run any faster. A couple of teenage girls in flip flops had started running with us. “Wait for us,” they yelled. At last we started the descent toward the white bridge. I could feel pain shooting through my quads with every step, but it was good pain and after a short climb we were on the white bridge, then over it, rumbling toward the track. At the high school, I couldn’t see the official race clock and didn’t know how much time I had to run those final 250 meters. It wasn’t until we rounded the final curve that I realized I was going to make it — with 30 seconds to spare. Final thoughts: 1. A great pacer can make all the difference – Christian pushed me just enough without being pushy. Duff took the initiative and pulled me up the 6-minute hill. 2. A bandana that holds ice is a good thing to have in the canyons when it’s 90-100 degrees 3. When you’re training, following your cravings and “going by feel” works, but not during your taper or during the first 30 miles of a 100-miler. Be smarter than your taper! 4. Setting goals along the way is a great way to motivate yourself late in a 100-miler, even if those goals mean nothing to anyone but you. 5. Sleep works! Hey, Christian, thanks a lot. And, Lewis, you’re not a bad writer. Perhaps you should consider writing for a living. Fun report and great job at the race. thanks, LB! Hope we can race to Auburn again in ’10! Maybe Christian will be there, too? the look on your face in the last photo is priceless. I think your best day there is yet to come. Wondering with this easy process to throw your name into the hat at WS this year, no filling out an application, no mailing, just a click of the button….wondering if lottery process this year will be supersaturated with a bunch of tire kickers. @Cougarbait, yep. i think your dead on. i think they should at least make you give the CC number. @Cougarbait, Actually, I kind of like the idea of a bunch of tire kickers getting in the race. After all, it’s diversity. @AJW, Easy for you to say…actually, you earned your way in, but — as I was saying, easy for you to say! Nothing wrong with diversity, just wondering how many will drop out of the process once the lottery is drawn and then…..how all those mystery spots will get filled? Its business 101, low barrier to entry = saturation. There is no effort, no check on hold, no scrouging around to find proof of qualification — even proof of volunteer work prior to entry, all those little things would weed out the fluff. @Cougarbait, Weed out the fluff? I say the more fluff the better. But, that’s just me. 4) and then you have my favorite: failure to fulfill the mandatory volunteer service requirement. Oh well, the process is much easier for us. I’m glad I’m not Mark Gilligan right now. @Craig, How will the race handle that, if people get chosen in the lottery and then end up not having a qualifier, or are fake names, or have a change of heart, or do not fulfill the service requirement? Do they pick a waiting list in order at the lottery so that other sincere and serious registrants can ultimately participate in the race? And does the race have some deadline where if a lottery pick has not applied then the race notifies a runner on such a waiting list so that they can have a chance to run in the race? It’s sad that anyone would apply who wasn’t serious about being in, and doing well at, the race. Thanks also for your questions on AJW’s blog tonight. I, too, am really interested in the responses. Yours were, I thought, inquisitive, yet respectful and non-threatening questions.